This invention reminds me of the small gasoline generator we used when spending a weekend at one of the electricity-deprived areas in Sabah. Speaking of creativity, you can turn water into food, weapon, house, or you can turn a falling water into electricity. 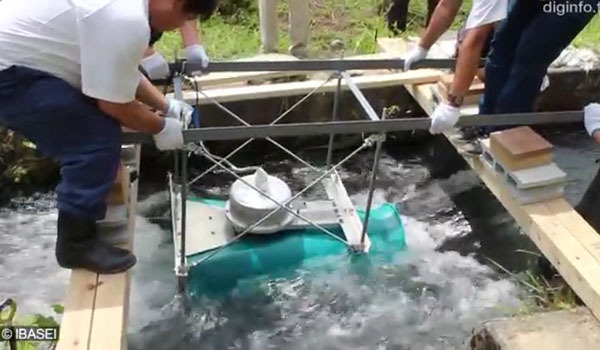 One such creative use of falling water is the following small-sized hydroelectric power generator. Powered purely by water, this generator can produce about half the power of what your typical 600W gasoline generator is capable of. As long as rainfall continue to fill streams and rivers, water can be a renewable source of energy. 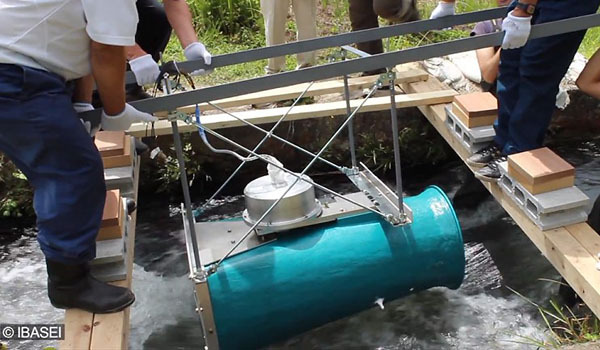 Japanese company Ibasei has unveiled a new idea in hydroelectricity generation; a turbine that can be placed in virtually any fast moving stream or river to generate small amounts of electricity for immediate use or as a charging station. Called the Cappa, it resembles an engine on a jet aircraft and can be easily placed into a location in just minutes. The idea behind the Cappa is that not all hydroelectric systems need to be huge, and they don't have to plug a river or be situated at an optimal location either. Instead, any spot where the river narrows causing swift movement of the water can be used. The Cappa is put in place by fashioning a couple of spans of some sort across the river or stream to form bridges. The turbine is then lowered into the water and held in place by the frame resting on the span. Once in the water, the Cappa goes to work without any further ado. 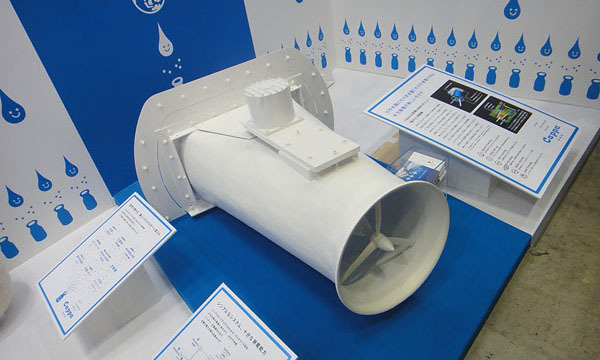 For water running at 2 m/s the turbine will generate about 250 W of electricity. Placing five of them in a stream could conceivably produce up to a 1 kW (allowing for control losses). 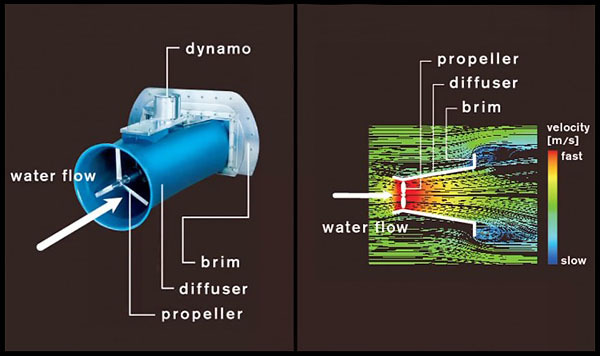 To increase the efficiency of the turbine, engineers have tailored a diffuser that causes water flowing over the blades to move faster. The Cappa was developed for a variety of purposes, from use as in-place generators at outdoor parks to emergency backup systems, particularly in the event of a flood. It can also be used as an alternative to gas powered generators that people use when the electricity goes out. This is essentially a venturi tube with a propeller in its' throat. With a design like that, it is easy to duplicate at a much lower cost. Add a mesh screen on the front of it and you would take care of the debris that could have surely hit the blades. The downside, however, is that at a price of a compact car, (say, Myvi @RM35,000 or US$11,000) many would give this a pass. 'Tree huggers' would love it but the cost would be too prohibitive. Kudos to a bright idea though, it opens up a lot of possibility for the folks in the interior.